Beginner BUNDLE 28 Vinyl Cutter Cutting Signs & Stickers + Design/Cut Software. If you are like many of our customers who want to learn how to make signs and stickers but are on a low budget, this bundle may be ideal for you. The only one machine you will need is a computer with Windows on it. In no time, you will have made stickers to apply to so many flat substrates or surfaces. But that's just the beginning! With this machine, opportunities are vast for anyone to make a living out of it. For a limited time, SAVE BIG with this amazing beginners kit that includes the following items. 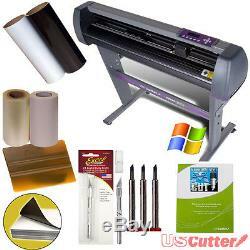 1x 28 USCutter MH Series Vinyl Cutter with Stand. 1x VinylMaster Cut - Design & Cut Software. 2x sheets 12" x 24" white magnetic blanks. 1x roll Greenstar Black vinyl, 12 x 5 yd. 1x roll Greenstar White vinyl, 12 x 5 yd. 1x 6 by 100 ft GreenStar Classic transfer tape roll. 1x 6 by 100 ft GreenStar Clear transfer tape roll. 1x Hobby knife for weeding and cutting. NOTE: This cutter/plotter is not compatible with Apple/Mac computers. NOTE: This cutter/plotter is not contour cut / print & cut capable. THE MH SERIES VINYL CUTTER. This MH 721 Vinyl Cutter Beginners Kit includes. 28 USCutter MH Series Vinyl Cutter w/Stand. Connectivity options: Serial, and USB. Pen adapter (use to plot instead of cut). Edit images, draw shapes, customize text, modify signs, create logos, and so much more. VinylMaster Cut software is quite possibly the best vinyl cutting software on the market today. With built in vectorization tools, compatibility with all the major image formats, even low quality jpeg and bitmap images, VinylMaster Cut can quickly and easily turn a broad variety of images into cuttable vector path designs in seconds. Simply use the VinylMaster Cut image trace feature on any image and it will be converted into a plotting file ready to cut or make further edits. Design and Image Editing Tools. VinylMaster Cut functionality includes text tools, curves, shapes, logos, and more as well as the ability to import from AI, EPS and PDF files easily. In addition to the VinylMaster Cut variety of tools, there are a number of clipart samples. With dimension and layout tools, your design will be completed accurately while saving material from being wasted. Editing nodes, customizing and adjusting shapes, and welding and manipulating paths are all easy to use and reliable functions with VinylMaster Cut. For production runs of vinyl projects which require layering of multiple colors, VinylMaster Cut has an innovative spooling function which is much superior to the competition. Send multiple jobs to the queue and sort by color: only the parts of the design in the specified c.
Olor will be cut, allowing you to complete multiple multi-layered multi-color workflows without switching between rolls of different colored vinyl. While cutting with VinylMaster Cut is limited to one user, use of the software is available to unlimited users. Your design team, digital printer and vinyl cutter specialist can all collaborate using one license and send the cutting file to the computer connected to your cutter when it's time to actually cut the job. This allows you to design and work from any location. Pentium processor-based PC or compatible computer (Windows). 512 MB of RAM or more. At least 50 MB of available hard disk space. USB Port 1.1 or 2. Two Rolls Greenstar Vinyl (Black and White). Each Roll 12 x 5 yd. GreenStar IPV vinyl is part of an exciting new line of products now available from USCutter! GreenStar Intermediate Performance Vinyl (IPV) is a 5-year, calendered vinyl, custom formulated for basic sign use. All colors come in a high gloss finish, with black and white also available in a matte finish. Green Star IPV vinyl is great for general purpose interior/exterior graphics of all types including signs, banners, and window graphics. An excellent vinyl to cut, weed and transfer, Green Star IPV vinyl has an outdoor lifespan of up to 5 years (3 years for metallic vinyl) and is made in USA. Two 12" x 24" Magnetic Sign Blanks. It is specially magnetized for NO dead spots. The 30 mil flexible material holds onto vehicles even at high speeds. They conform well to most metal surfaces and are easy to remove. Simply apply your vinyl letters, printed vinyl graphics, or screen print ink. They are perfectly sized for vehicle doors. Just add your graphics and you are ready to go! One Roll GreenStar Layflat Classic Transfer Tape, 6in by 100ft. Designed with the professional sign shop in mind, at a price that an entry-level user can appreciate! This product is an easy to handle paper application tape, comparable to leading transfer tape brands. It tears easily, and has no stringy adhesive. USCutter's GreenStar Layflat Transfer Tape works great in either wet or dry applications making your vinyl installation process smooth and trouble-free. We are sure you will love this transfer tape... One Roll GreenStar Layflat Clear Transfer Tape, High Tack Adhesive, 6in by 100 ft.
USCutter is pleased to introduce a clear transfer tape that offers static-free application. This makes registration of multiple vinyl colors and layers simple. It has a rigid film liner that will keep your graphics laying flat until you are ready to apply them. This film has a High Tack Adhesive. It works great in either wet or dry applications. The unique surface can even be marked with a pen or a pencil! One Excel #1 Light Duty Knife with Cap, Round Aluminum Handle. Excel #1 Light Duty Knife with Cap, Round Aluminum Handle with a No. 11 blade for precision cutting of lightweight materials like paper, plastic balsa, thin metal, cloth, film and acetate. 11 blade and a safety cap. Ideal for films, vinyl, graphics, stickers, wallpaper, etc, eliminating bubbles and making surfaces tidy. Made of plastic material, the edges stay smooth and clean for easy slide on vinyl or other materials. USCutter does not verify these specifications. We ask the manufacturers to provide accurate specifications rather than encouraging inflated numbers. On budget machines, speed, force, and accuracy specifications are largely irrelevant because they identify the theoretical rather than practical limits. That said, budget machines are typically compromise on speed, reliability, and noise rather than accuracy, and you should be able to do almost anything with a budget machine that you can with a professional model. Our competitors will advertise numbers that are displayed on a control panel (inflated) rather than identifying mechanical limits. It is most important to evaluate the machine as a whole. Specifications on Japanese-made machines are generally accurate and reflect their superior quality. Vinyl Cutter, Stand, Cover, Blade Holder, Pen Attachment, Serial Cable, USB Cable, Power Cable. We start more auctions at 1 cent because we are confident that we can always offer the best price. We get the best pricing; you get the best value. Other's claim to be top sellers, but look at their feedback and see the truth! Community - We have a huge online forum where you can learn more and see how we are committed to improving our reputation through outstanding service and support. Any equipment older than 30 days may be replaced with a certified refurbished unit at our discretion. If an item arrives in an unusable condition, USCutter must be notified within 30 days of receiving the product or a return may not be allowed. Consumable Material: Vinyl, transfer tape, and other supplies are not eligible for return once the packaging is opened. Software: Software is not eligible for return under any circumstances. If the disc is determined to be defective a digital download for the item may be supplied at the discretion of USCutter. Local pickups are not available. We do sell products internationally and do our best to minimize problems but it is impossible to eliminate all potential issues and delays. National holidays do not count towards expected time of transit and should be calculated as an additional day of transit. The item "USCutter 28 Vinyl Cutter Plotter KIT + Design/Cut Software Make Decals Signs" is in sale since Friday, February 19, 2016. This item is in the category "Business & Industrial\Printing & Graphic Arts\Plotters, Wide Format Printing\Cutters- Wide Format". The seller is "uscutter" and is located in Memphis, TN.